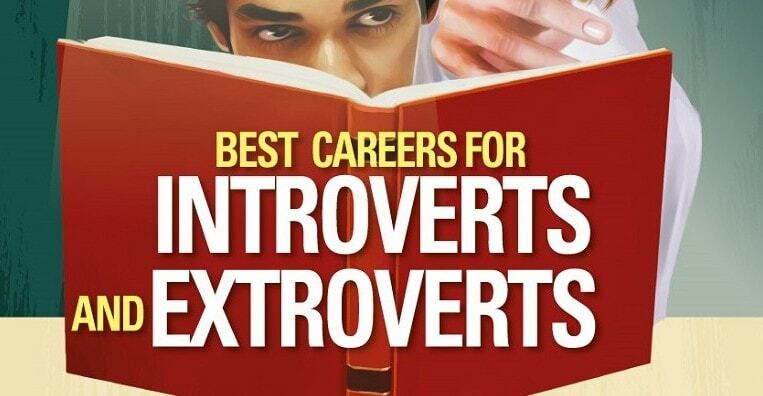 What Careers Best Suit Introverts and Extroverts? Would you identify yourself as being an introvert or an extrovert? You can find people who fall under each of these categories in most workplaces and particular traits displayed by each personality type mean that they tend to work in different ways. For example, some of us strive when working with others, whereas others perform better when they work on their own. For this reason, certain jobs are better suited to introverts and extroverts. Apparently, 60% of the population consider themselves extroverts, however, it isn’t always black and white and a lot of us display a combination introvert and extrovert characteristics. So how do introverts and extroverts behave in the workplace and which jobs are best for which type of personality? This infographic by careerassessmentsite.com investigates. What are the common traits of introverts and extroverts? Energised by others and has a big group of friends and acquaintances. How do introverts and extroverts behave in the office/classroom? Extroverts enjoy getting involved in verbal discussion and are quick to share their thoughts and opinions with others; whereas introverts prefer a quiet workplace and will take more time to gather and examine information before making decisions. Extroverts like to brainstorm in big groups, to hear others peoples ideas and share their own. In contrast, introverts are more likely to work alone on independent projects. Extroverts will often initiate group activities/gatherings and enjoy conversations about personal matters, whereas introverts would much rather keep their life outside of work private and only get involved in work-related discussion. What are the best jobs for introverts and extroverts?